Huawei Annual Sports Day meet happened today in Aerospace Beijing University. Many Indian team members including me participated in the march-past event. The sports day was fully packed with numerous games, athletics and prize distributions. Maye, my colleague in Huawei Technologies, a very good Chinese friend and a well-wisher. I always used to call Maye as Gege, which means elder brother in Chinese. 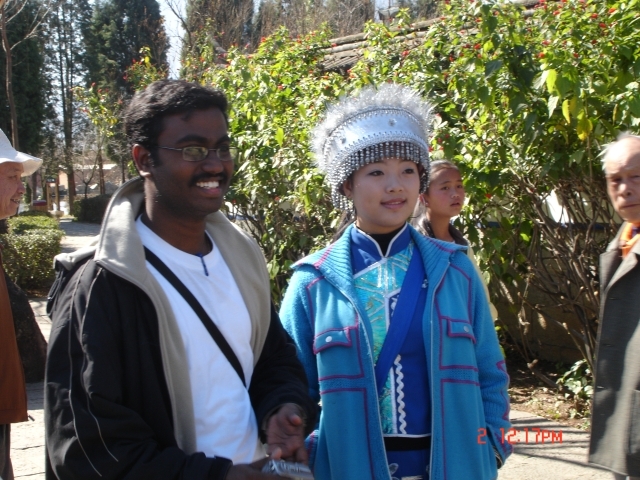 He invited me and Prashanth to visit his home in Wuxi city during May holidays. We decided to visit Shanghai for 2 days and spend other 3 days at his home. 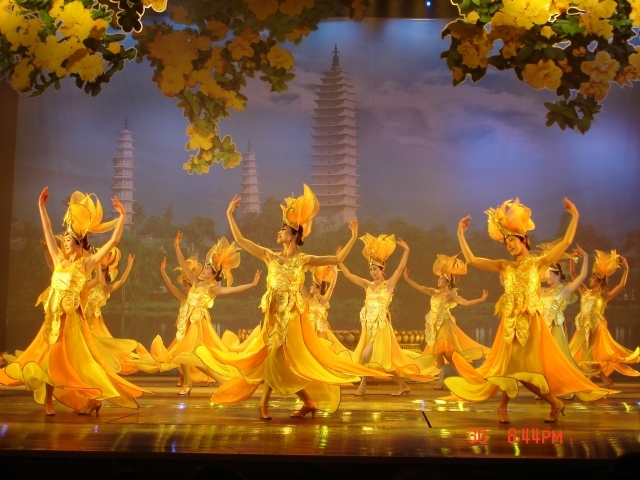 Wuxi is an old city in Jiangsu Province with its tourism slogan as “Wuxi – Full of Water and Happiness”. Maye’s home is simple and beautiful and his parents and grand-parents gave a warm welcome to us. They were bit excited to host foreigners in their home. They were not conversant in English, so they communicated to us via Maye and his wife Emmy. We had good food in his home prepared by Maye’s father. We made a short presence to Emmy’s home also in Wuxi and her parents were so kind to greet and serve food to us. 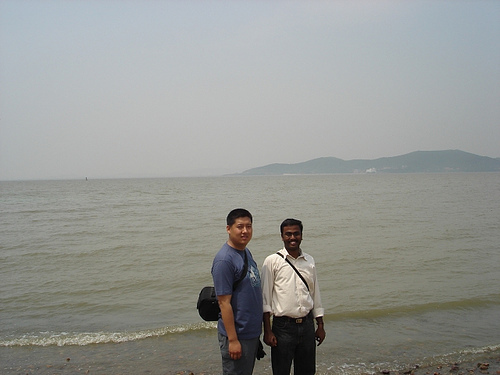 We made our visit to Taihu lake – the largest lake in Wuxi, Turtle-head Islets, Ancient Market and Park. I’ve attended a Chinese wedding ceremony and it was Maye’s cousin sister marriage. The experience was very different to me and it was completely varied from Indian marriages. It was mostly resembling the western style with many people gathered on some round tables in a hall and each table served with variety of food items including duck, chicken, shark soup, shrimp, fish, prawns, crab, tortoise and pork. Interesting fact was goat/lamb won’t be served on marriage occasions. Everyone was busy in smoking and drinking to justify the Chinese saying “More drink; more happiness”. So the trip to Wuxi was a memorable one and I had an opportunity to stay with a Chinese family and experience their daily habits. Even I can’t forget their lovely dog named “lom-lom” (lom in Chinese means Dragon). The elders in the family were so kind and lovable and they were very concerned about our comfortableness there. Its obvious to say that, they’ve accepted me as their family member. Kudos to Maye Gege for his affection. 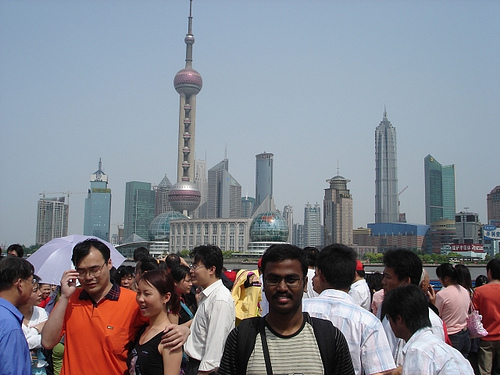 When I entered into the city of Shanghai (Chinese meaning: ‘up above the sea’) I had only the view of sky-scrapers and concrete structures. The new part of city, Pudong is organized with wide roads, pedestrian over-bridges with escalators, etc. The night view of Shanghai from Oriental Pearl TV Tower (3rd tallest tower in the world) was spectacular with flooding lights. Also a visit to 88th floor of Jinmao Tower (5th tallest building in the world) was a nice experience. An evening walk amidst crowd on the famous road Nanjing Lu (most happening place of Shanghai with approximately 1 million visitors per day and its the world longest shopping line of 6 km) was a memorable one. Trip to Shanghai will be incomplete, if one haven’t traveled in the MagLev, the fastest magnetic levitation train running at the speed of 289 km/hour. When I was amazed by looking into the awe-inspiring structures of Shanghai, a local Chinese commented that Shanghai is getting build to beat the city of New-york. Truly its worth saying that. Back to Olympics, Beijing having many roads with the countdown display for the game, which was started 2 or 3 years before. Many new bridges, subways and roads are under construction to make their Olympic slogan “One World, One Dream” to come into reality. Many of the local taxis are nothing but Elantra, Sonata or Jetta. Many pavements and gardens are fully dressed with colorful flower plants, which will blossom exclusively on August season. Local bodies are trying to control pollution as much as possible by pulling out industries from city scape to make it “Green Olympics”. A technical trivia, this Olympics will be the first “IPv6 Olympics” to be conducted. Beijing is in full preparation in making the entire communication network which covers the complete game, will be running on next generation IPv6 Protocol. 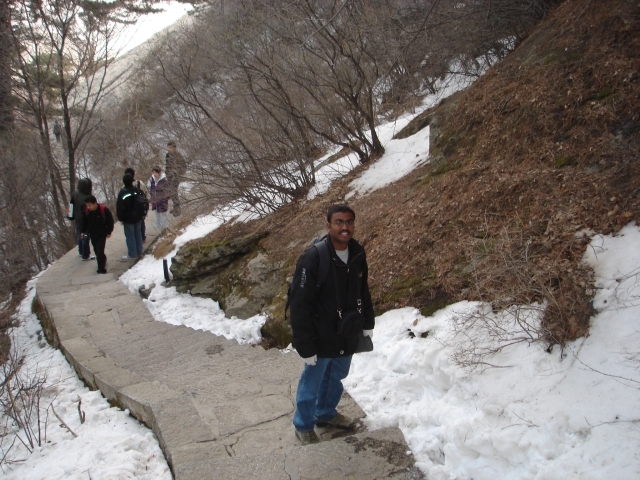 I had been to some trekking trips before, but this trekking in Hua Shan Snow Mountain was an unforgettable one. I with Avik, Yaaseen, Janardhanan and Prashanth went to Xian city and started our trekking at 10:45 PM. 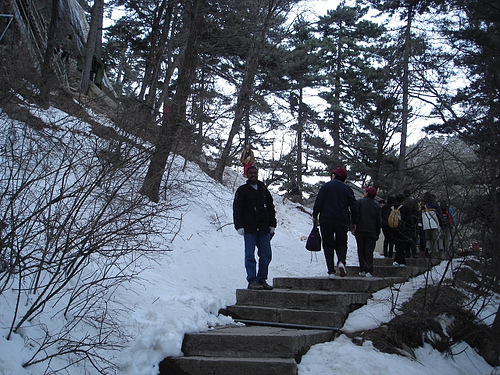 We’ve climbed the mountain path by steps and it was a tiresome climbing along with many Chinese guys. We had reached the summit at around 5:30 AM early morning. Many people gathered there to watch the “Sun-Rise” between the mountains and the view was spectacular one. After witnessing the sun-rise, we started down and then only I’ve realized that, the way was full of snow. I didn’t know that the top part of mountain was covered with snow when I had started climbing on previous day night. So we took some photographs on the way to mark the trip. After the trekking, we roamed Xian city and visited Bell Temple, Mosque and the world famous Terracotta Warriors. Bought my laptop – Dell Inspiron 6000 (Pentium 1.73 GHz, Wide-screen, 1 GB RAM, 80 GB HDD, DVD RW) in Hailoon, Beijing. It costs round 10,000 RMB. Hailoon is a biggest electronic market in Beijing, where one can find any electronic item. Wangfujing is a famous shopping place in Beijing located near to Forbidden City Palace. This place is easily reachable by Beijing Subway trains. Many shopping malls and food courts sprawled throughout the street. The interesting thing was on one side of the street there were full of street vendors with their stalls for eatables. 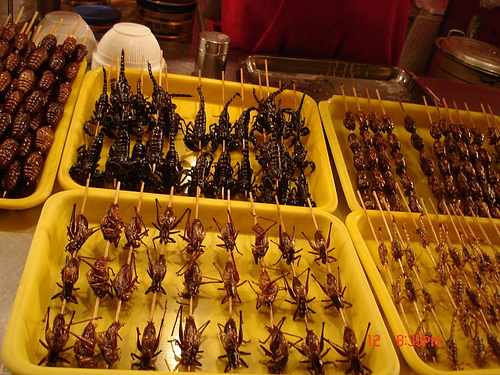 These eatables are nothing but pork rolls, snakes, cockroaches, red scorpions, black scorpions and other sea-foods rolled on a stick. Each stick costs 10 RMB, i.e. 3 cockroaches/scorpions for 10 RMB like 3 samosas/bajjis for 10 rupees 🙂 Many by-passers from children to old-people had their evening snacks there. Oops ! It was common in restaurants to get beef chocolates, donkey meat, pig ears, pig thigh, etc. 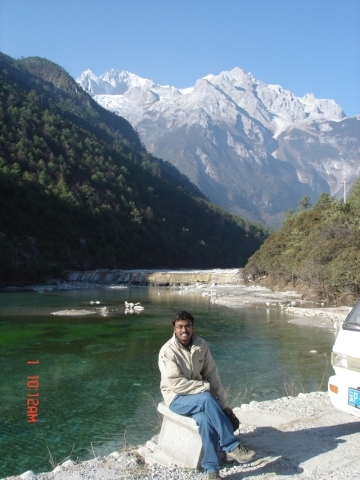 Lijiang city is famous for its UNESCO world heritage old town and Snow mountains. The breath-taking scenery of Snow Mountain and crowded narrow paths of Lijiang ancient city were quite interesting. We participated in the “evening dance” occurred in the center of old town with local Chinese folks. Tour guide Miss. Barbara accompanied us to some places in the city like Black Dragon Pond, Public Forum and she belongs to Yunnan Ethnic group called Naxi. Our flight reached Kunming (capital city of Yunnan province) airport at 1:30 AM. Tour guide Mr. Wine accompanied us to head towards hotel room. Morning we visited “Stone Forest”, which is a huge hill area covered with full of black vertical stones. Afternoon had traditional Chinese food (anyway, I didn’t like that taste of food items soaked in vinegar). Evening visited “Window of world” center which is shopping complex and bought a small monkey jade dollar. Jade is a precious stone for Chinese, they have high regards on Jade like Indians on Gold. Then we started our journey towards Dali city in a double-decker train. Forget to say that “we” here includes Vijay, Prashanth, Janardhanan, Yaaseen, Jayanth and Ashish. Three days after, we visited Yunnan Nationality Village and Dianchi lake in Kunming. Went for cycling near the lake and roamed around the “Walking Street”.